Over the years, hundreds of HSU graduates have joined the Peace Corps to get a head start on their careers and make a positive impact in communities around the world. 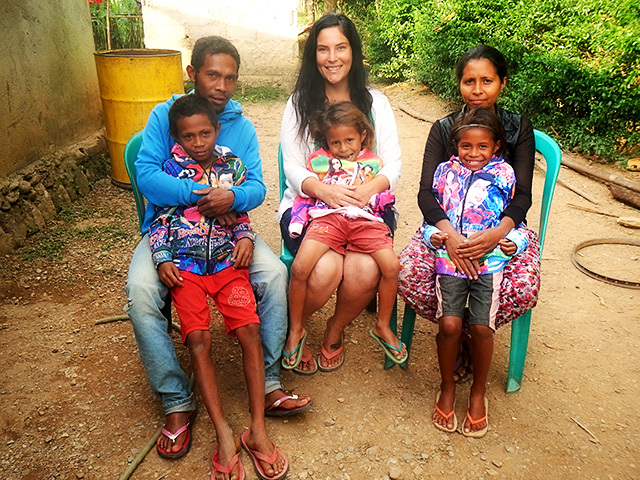 HSU Grad Kayla Masengale (‘15, Child Development) is currently serving as a community development Peace Corps volunteer in Timor-Leste in Southeast Asia. Recently Humboldt State University was ranked No. 5 among medium-size schools on the Peace Corps’ 2017 list of Top Volunteer-Producing Colleges and Universities. It’s the 10th year in a row that HSU has been a ranked as a top volunteer-producing school. HSU has been ranked each year over the past decade and is one of five California schools to make this year’s list. There are 33 HSU alumni currently volunteering worldwide—and Kayla Masengale is among them. Since the Peace Corps’ founding in 1961, 841 Lumberjacks have traveled abroad to serve as volunteers. Service in the Peace Corps is a life-defining, hands-on experience that offers volunteers the opportunity to travel to a community overseas and make a lasting difference in the lives of others. Other recent graduates like Jocelyn Keranen (’13, Geography) started their careers with service in the Peace Corps. Currently, Keranen is serving as the malaria coordinator in Dar es Salaam in Tanzania. Kiera Yeomans (’15, Environmental Studies) is using Peace Corps service to complete a master’s degree that combines social advocacy with climate change awareness at Antioch University in New Hampshire. The Peace Corps has simplified its application process with a focus on volunteers. A straightfoward and personal Peace Corps application process can be completed online in about one hour. Applicants can learn more about service opportunities by assignment area, country, and departure date by visiting the Peace Corps website and connecting with a recruiter. The Peace Corps ranks its top volunteer-producing colleges and universities annually according to the size of the student body. Below find the top five schools in each category and the number of alumni currently serving as Peace Corps volunteers. View the complete 2017 rankings of the top 25 schools in each category here (PDF) and find an interactive map that shows where alumni from each college and university are serving here.